My favorite is fantasy with lots of exotic handsome guys.Unless they are cooks, or like animals. My hero was Steve Irwin he was an awesome guy! 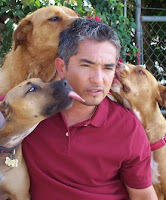 Now it's Cesar Millan and Jackson Galaxy, true dedicated men. I salute them. -At the moment I like Salvatore's Legend of Drizzt. Not the new Neverwinter series with Dahlia because the old companions of the hall were much better. I was sorry that they died. Esp when Catti could have lived a couple more years than being captured by a stupid Ghostking!